“It’s important for life to get back to normal as soon as possible. Removing this green waste is also important for the safety of residents and visitors. “Mother nature is unpredictable and it is difficult to budget for this, but it is imperative that Council finds the money to get the Gold Coast back to its best as soon as possible. “The one-off pick up will commence on Monday simultaneously at numerous locations across the city. We estimate it will take two weeks to complete. Council resolved yesterday to waive fees for disposal of green waste resulting from clean-ups of Gold Coast residential properties impacted by ex-tropical cyclone Oswald. 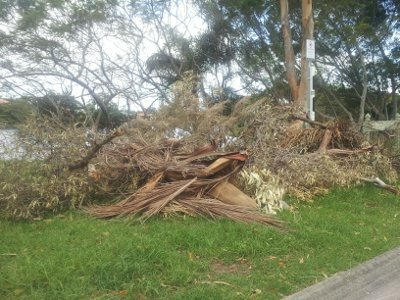 Mayor Tate said Commercial operators delivering storm debris (green waste) from domestic properties within the Gold Coast will get free disposal until Friday 15 February. “There are long queues at most Council waste facilities and disposal capacity is under pressure. If disposal is not urgent, we request residents wait to dispose of waste over the next few days,” he said. Domestic putrescible waste (food waste from power outages) can be taken to Mudgeeraba, Tallebudgera, Miami, Merrimac and Molendinar Waste and Recycling Centres. Only small volumes per vehicle are being accepted, although larger volumes will be accepted at Maudsland and Helensvale. “While Merrimac Waste and Recycling Centre is now open, Mudgeeraba Waste and Recycling Centre is facing frequent short-term closures due to high demand. When this occurs, we ask residents to please go to other nearby facilities or delay the trip if possible,” he said. Disposal is as per normal for commercial contractors dealing with general and other wastes. Call 5581 6799 if your bin has been damaged or lost, to arrange new bin.